This lecture will be addressed to a wider audience: undergraduate and graduate students in mathematical and statistical sciences, PhD students, and professionals. It will be shown that diverse and intriguing mathematical problems from the above mentioned areas can be solved quite elegantly by using ideas and techniques from Probability. Sometime these are the only available solutions. $\bullet$ Combinatorial and algebraic identities. 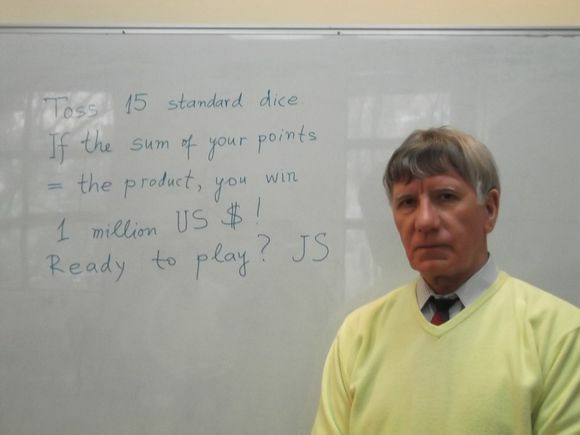 $\bullet$ A problem involving two dice, fair or unfair? $\bullet$ Toss 15 dice, if your sum = your product, you win 1 million! Ready to play? $\bullet$ Bernoulli LLN and Weierstrass theorem by Bernstein polynomials. $\bullet$ Old Uspensky’s problem and its far extensions. $\bullet$ Buridan Donkey story. Random walk in random environment. $\bullet$ Many ways to interpret and solve the equation $X + Y = XY$. $\bullet$ Values of the Riemann zeta functions via Cauchy distribution. $\bullet$ A few exercises and one unsolved problem. Questions and suggestions from the audience during the lecture are very welcome.